I have decided on a dish from the menu and i`m ready to order. I just need to say in broken English a simple «can i have a burger?» and everything will be fine. «Hello, how are you?» asks the waiter. I`m confused, who is this man to ask how i am? «burger, I`m fine.» i say in a shy Norwegian manner. Why are people everywhere asking if I`m alright? Is my shirt wrong? Do i have a spurs burger all over my face? Everyone seems to want to know how i`m doing. If a stranger in Norway would ask me the same question, I would say a polite «fine» before I ran terrified home to my quiet apartment. I would tell my girlfriend Anne, and Anne would tell her friends, and her friends would tell the newspaper, and suddenly it will become a huge debate about loneliness in the national media. Almost. We are still adapting to the South-African culture. 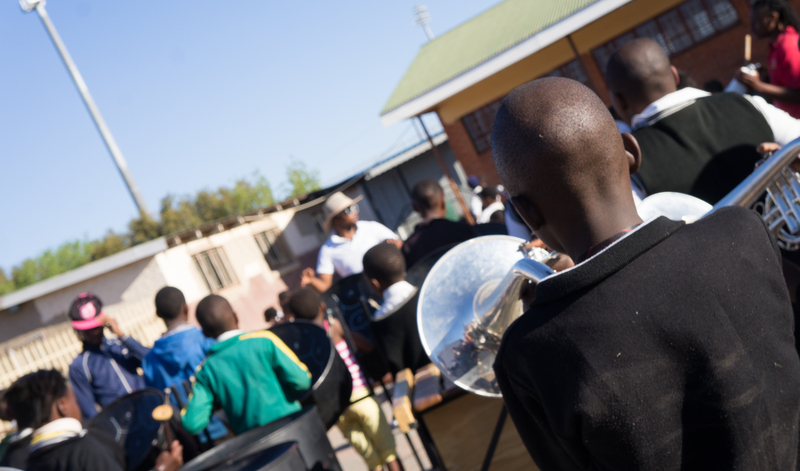 The last two weeks we have been visiting bands in both Parys, Vredefort and Viljoenskroon. Here`s a picture from a rehearsal.